Irritable Bowel Syndrome, Heart Burn, Acid Reflux, Bloating, Crohn’s, Celiac, Diarrhea/Constipation, Gastritis, Colitis, … all have one thing in common. Treating the “Label” does not get you very far. Why you have the symptoms is typically not answered by most doctors because it will not change the recommendations. Medications treat symptoms by shutting something down or turning something off. Place patient on medication that slows down or shuts down digestion or bombard with steroids or anti-inflammatory drugs. Both Models Fail To Answer “Why Do I Have Symptoms?” If you want to get rid of the symptoms you need to find out the cause of why you have Inflammation in the first place. Where Does Inflammation Generally Start? When we are talking about chronic, low level inflammation we are really talking about an immune system that is dysregulated. To find this inflammation we need to go to where most of the immune system is located in the body. 70-80% of your body’s entire immune system is located in the lining of your digestive tract. 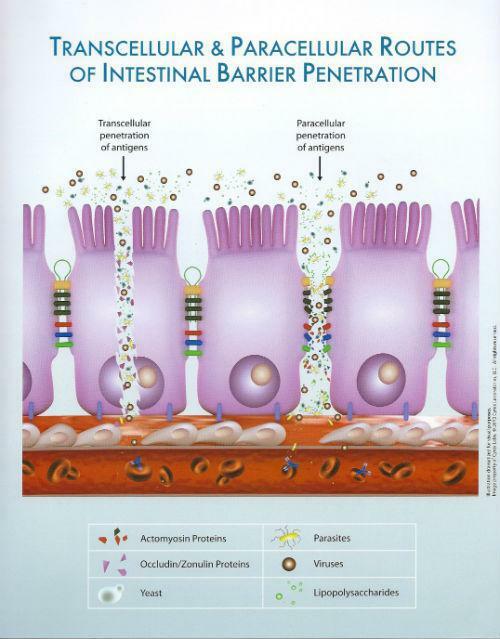 The cells lining your gut are part of your mucosal barrier and it is designed to protect your body. This lining can become damaged and broken, allowing inflammatory antigens to enter systemic (whole body) circulation. This is called “Leaky Gut Syndrome”. Yes, it is as bad as it sounds. These inflammatory antigens get recognized by your body’s highly efficient defense system, your antibodies. Your antibodies are like your body’s military. Your antibodies then make a concentrated effort to attack and destroy the antigens that they have spotted in the blood. This causes an “inflammatory response”. When this scenario plays out day after day, week after week, and year after year Leaky Gut Syndrome and CHRONIC DISEASES DEVELOP. Science now recognizes that Inflammation is the cause of most chronic diseases (Cardiovascular disease, diabetes/insulin resistance, hormone imbalance, autoimmunity, osteoporosis, neurodegenerative disorders, depression, cancer, fibromyalgia, early mental decline, etc).